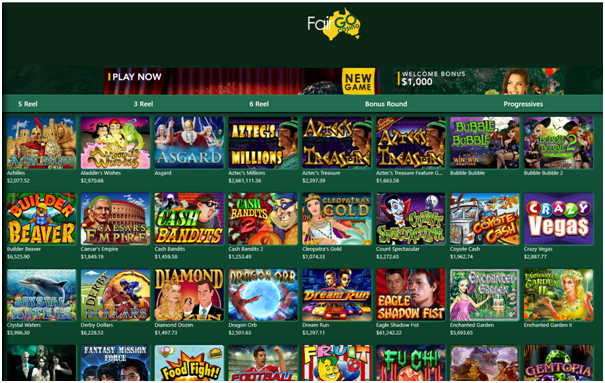 Fair Go casino is a new online casino specially catering to Aussie punters. This legit casino is owned by Deckmedia N.V. and licensed by Curacao Gaming Commission, was launched in 2017. The Fair Go website is quite austere, designed in dark green and a hue of golden color to welcome punters. It is pretty simple to navigate which gives punters the convenience to get all necessary info straight from the homepage. The casino’s logo reflects its ultimate goal to take over the Australians being designed in the Australian contour. The devotion to the Australian market goes even further as all amounts, including bonuses, are payable in Australian dollars. Though the website is tailor-made for the taste of the Aussie players and is concentrated on that part of the world, Fair Go is available to punters from any other location on the globe. With over 150 pokies to play powered by Real time gaming software this casino is the perfect choice to play real money pokies in AUD. 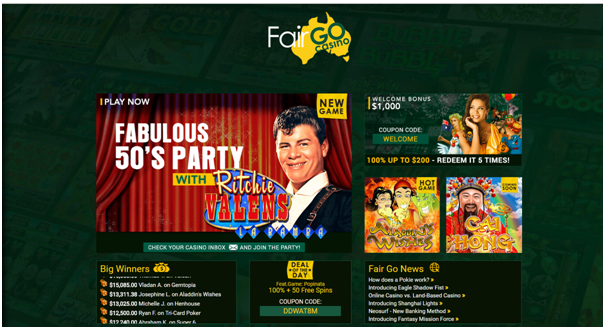 Fair Go is run by the platform of Realtime Gaming (RTG) and brings a wide diversity of casino games like video poker, video pokies, classic pokies poker, table games, roulettes, blackjack, bingo & keno games to the clients with the intention to establish itself as the largest casino Australia-based punter have access to. As said above over 150 pokies you can enjoy them in real time with your mobile or PC or tablet instantly. You can easily select pokies of liking as 6 reel, 5 reel, 3 reel, Progressives and Bonus Rounds, though the selection of progressive jackpot poker games is narrowed at present with only three pokies, but the library will be enlarged shortly. Amongst the most familiar pokers available at present are Orc vs. Elf, Megaquarium, Super 6, The Big Bopper and Vulcan. When stopping by at the Fair Go’s homepage, you will spot that the Table Games has a top placing in their game list. This casino has indeed a lavish assortment of table games like Perfect Pairs, Baccarat, the Caribbean sequence of Hold’Em Poker and Stud Poker, Face Up 21, a number of variations of Blackjack, like European Blackjack, Suit ‘Em Up Blackjack, Match Play 21, Pontoon, Let’Em Ride, and some pokies like Pai Gow Poker and Tri Card Poker to mention amongst many. The predominance of these table games goes with huge progressive jackpots. Video poker offerd 12 different games to select from. The huge register of Video Poker games varies from the standard to scarce games are not often found across the industry. The Video Poker variety includes Aces and Eights, Deuces Wild, All American, Double Jackpot Poker, and Jacks or Better and plenty more. Players also have at their disposal a brief inventory of peculiarity games like America Roulette, Treasure Tree, Craps, and Keno. 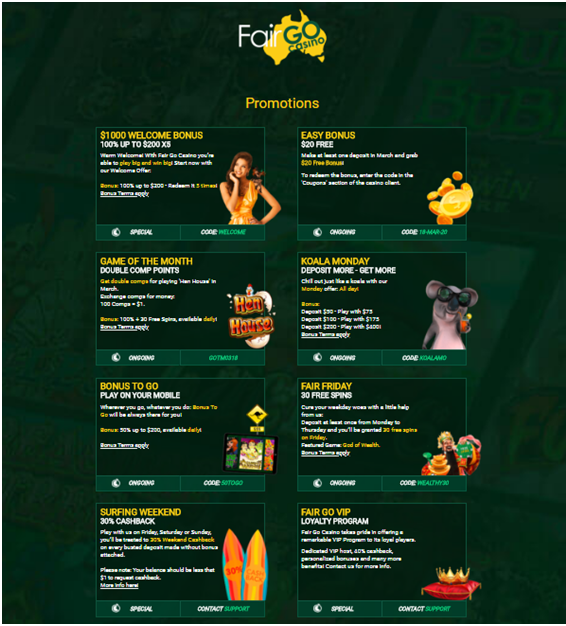 Fair go casino offers many bonuses and promotions for players. When you join the casino for the first time you are offered a lucrative welcome bonus of AUD1000. On your first deposit 100% up to $200 X5. All you need is to use coupon code WELCOME at the cashier when you make your deposit for the first time. If you join the casino with your mobile then you are offered 50% up to $200, available daily, just use coupon code: 50TOGO and redeem this mobile bonus. 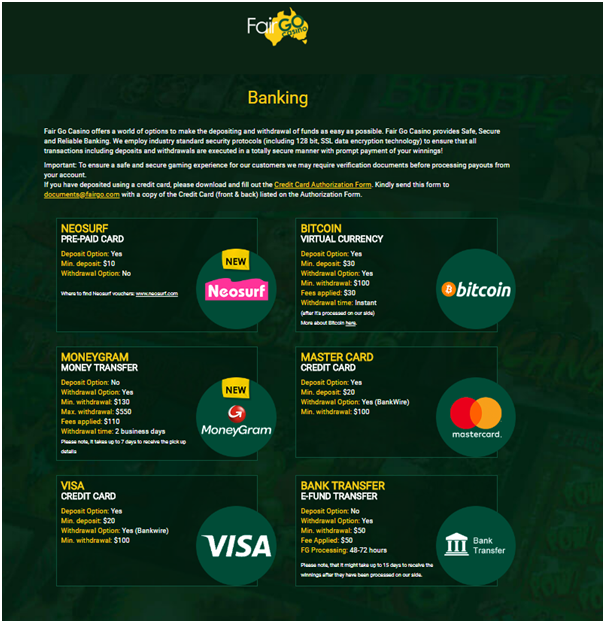 Fair go casino is liberal in offering various friendly deposit and withdrawal methods so that it is convenient for punter located anywhere around the world. The minimum deposits of $20 can be transferred via the familiar methods, Bitcoin, Debit or Credit cards /Visa, Mastercard/, Skrill, Paysafecard, Moneygram, Neosurf and Neteller. As stated on their website, deposits placed through these payment instruments are handled immediately. Players who are familiar with this cryptocurrency will appreciate it for providing quick and safe transactions. Bitcoin is a huge asset to Fair Go’s banking options and will be highly valued by the punters. The e-wallet payouts are rather fast however the bank transfers may take some 15 business days in worst cases. The currency Fair Go is operating with is only AUD and there is 48 hours pending period for the claimed withdrawals.